﻿ Fun Easy English - new american english standard acronyms internet cyber slang chatspeak netspeak shorthand translexical phonological abbreviations letter h.
In this lesson you will learn American English standard acronyms beginning with the letter H.
HDGFS How Does Get F***ed Sound? Hey do you know any English acronyms used in texting, instant messaging, and social networking websites beginning with the letter H not listed on this page? 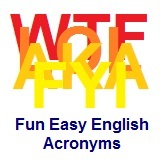 Then leave a comment below and add your acronyms to Fun Easy English. Found a word you do not know? Listen to American music while you study. These links contain many English learning resources. Some are for students, some are for teachers. If you find information not on Fun Easy English, please post a comment below, and I will make every effort to add it to the site. Thanks.